Carl Orff belongs to that select group of composers, known as �one-piecers�. Everybody knows his Carmina Burana; most people probably haven�t heard a note of the rest of his oeuvre, which is large and varied. All right, being remembered for one work alone is better than not being remembered at all, but in Orff�s case he should be � and once was � famous for something else: his educational work. When I went to Teachers� Training School in the 1960s (How Time flies!) we spent a substantial part of our music education studying Orff Schulwerk. Originally created in the 1920s, this is a music training method, with very little music theory. Instead it advocates practical music-making where ensemble work is central to the course. He also created an instrumentarium, consisting of mainly percussive instruments including the xylophone. The renaissance in our time of the recorder is very much thanks to Orff. One more aspect of his music training concept is worth mentioning: movement, dance and improvisation. It seems that the formal music training Orff had in his youth was of very little importance to his development as a composer, nor was the music of contemporaries such as Debussy, Strauss, Sch�nberg. It was when he started to study the works of the old masters � Palestrina, Lassus, Monteverdi, Sch�tz � that he found his own voice. When his break-through came in 1937, with the aforementioned Carmina Burana, he finally knew, at the age of 42, that this was his true style. He rejected everything pre-Carmina, except three works, of which two are on the disc I so far haven�t started reviewing ... but soon will. All of them are transcriptions, or arrangements, or reworkings of music by Claudio Monteverdi. It had been fairer to have mentioned Monteverdi on the front of the record, but you have to look on the back-cover to find his name and even then it is in very small print. But since this disc is part of a bunch of discs featuring Orff�s music, all of them with a similar layout, it is perhaps understandable. What about the music? In 1925, when Orff presented these versions of Lamento d�Arianna and Ballo dell�ingrate, Monteverdi was little played. Interest in early music was awakening; Ottorino Respighi made his own performing version of La Favola d�Orfeo for example. Today, with the early music movement in full swing, we are used to original instruments and historically correct performance practice. Thus the first bars of Arianna�s lament come as a shock. It isn�t the colourful Stokowski-way of re-writing old music; Orff is sparse in his instrumentation. He uses a couple of basset-horns, a couple of harps, three lutes � and the full string section of the Munich Radio Orchestra! And that at once gives the music a decidedly romantic feeling. Arianna � or Ariadne� (for she sings in German) - then enters in the shape of Rose Wagemann who is closer to Wagner�s Valhalla than Monteverdi�s Mantua. Her is a fruity, vibrato-laden contralto and I suppose that by now all early music addicts have stopped reading this review. If so, that�s a pity, for the interesting thing is that after a time you get used to what you hear and accept it on its own terms. What I mean is that with our �modern early baroque ears�, if you accept the metaphor, we will never feel transported back to 1608. However a trip back to 1925 is also of historical interest. And when you get used to the singing style you realize that the singer is good, she is observant to the text and she can tame her vibrato. Singing in German makes the music sound more four-square than necessary but still, in the end, I was deeply moved by the performance. And interestingly, after finishing the Orff-version I played the real thing with the right instruments and soprano specializing in early music, and it left me unmoved. If you are still reading: give it a try! I have to admit that Tanz der Spr�den (Ballo dell�ingrate), also from 1608, was harder to digest, and the fault is probably mine. Here, in a more dramatic context, the singing style became an obstacle rather than a help to get into the action. The singers are good of course; besides Rose Wagemann, (whom I have come across only once before. She sings the House-keeper in Leinsdorf�s recording of Korngold�s Die tote Stadt, recorded roughly in the same period as these Orff-pieces were made, i.e. mid-1970s) we have world-stars like Lucia Popp (glittering as usual), and the imposing Karl Ridderbusch who has an almost tenoral top-register but also produces an impressive low D. His delivery of parts of the role is even more Wagnerian than Miss Wagemann�s. The most entertaining part of this Ballo is the purely orchestral �Tanz der Spr�den�, which sports lush string playing. The little we hear of the Bavarian Radio Chorus is good. Kurt Eichhorn is an experienced conductor and having the composer as supervisor is a guarantee that this is an authentic performance. The explanatory text in the booklet by K.H. Ruppel is a great help and we also get the sung texts, but no translations. The sound quality is good without being exceptional. The playing time is very short, less than 42 minutes, but honestly I don�t know what else could have been logically placed as filler(s). The only possible work is Orff�s third Monteverdi-piece, Orpheus, and it occupies another disc in this series. Anyone with a historical interest (an interest in the not so distant past) or those of you who already know Carmina Burana and want to hear something else by Orff, could give the disc a chance. Maybe you should try to listen before purchase. 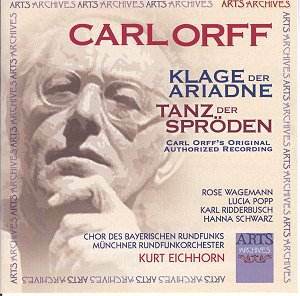 I warmed to the Ariadne-performance and will certainly return to this disc again � but probably not very often.